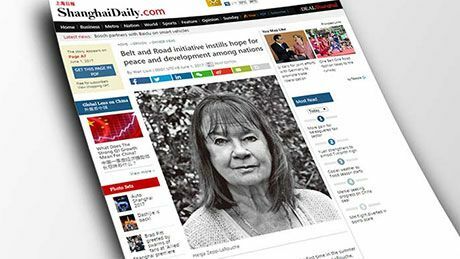 May 15 — Helga Zepp-LaRouche, founder and president of the International Schiller Institute, is right in the middle of the action in Beijing during the Belt and Road Forum for International Cooperation. This comes after decades of leadership by Lyndon and Helga LaRouche for just this kind of mobilization for worldwide development. 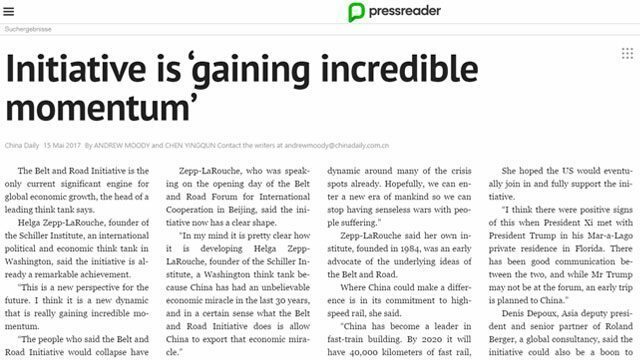 Since the 1990s, and Zepp-LaRouche’s first participation in an international conference in China, where she called for a “Eurasian Land-Bridge,” she has become widely known as the Silk Road Lady. Representing the Schiller Institute, Helga Zepp-LaRouche spoke on May 14, on the first day of the B&R Forum, on the panel, “Belt and Road for Facilitating Strong, Balanced, Inclusive and Sustainable Global Economy.” She said, “The Belt and Road Initiative has the obvious potential of quickly becoming a World Land Bridge, connecting all continents through infrastructure, such as tunnels, bridges, reinforced by the Maritime Silk Road. As such, it represents a new form of globalization, but not determined by the criteria of profit maximization for the financial sector, but for the harmonious development of all participating countries on the basis of Win-Win cooperation. Predictably, the geopolitics crowd, centered in London, is having a fit. The Economist in London today ran a stream of bilge, headlined, “The Economist explains, “What Is China’s Belt and Road Initiative?” They write that businessmen in Central Asia call it the “One Road, One Trap,” because B&R projects are unreliable. 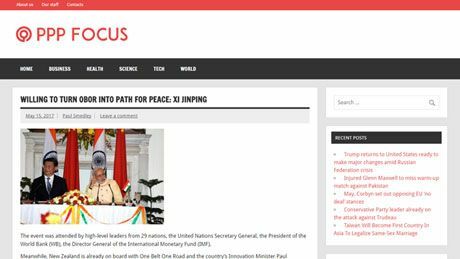 And “the Belt and Road Forum has an unfortunate acronymn, BARF,” etc. But back in reality, not only does the Belt and Road Forum mark the process of potential world economic and scientific lift-off, but there is a vital process underway of deliberation over points of immediate suffering and possible all-out war. President Trump’s envoy in Beijing, Matthew Pottinger, is now in South Korea for consultations over concerns in the region. On Syria, as peace talks start on May 16, called “Geneva 6,” numbers of meetings are set for this week, of Mediterranean leaders who met in Beijing with both Xi and Putin. In Washington, D.C., May 16, Turkish President Recep Tayyip Erdogan will meet with President Trump. On May 17, in Sochi, Italian Prime Minister Paolo Gentiloni will meet with Putin. Likewise, Greek Prime Minister Alexis Tsipras met in Beijing with Xi, Putin, and also with Russian Foreign Minister Sergei Lavrov. 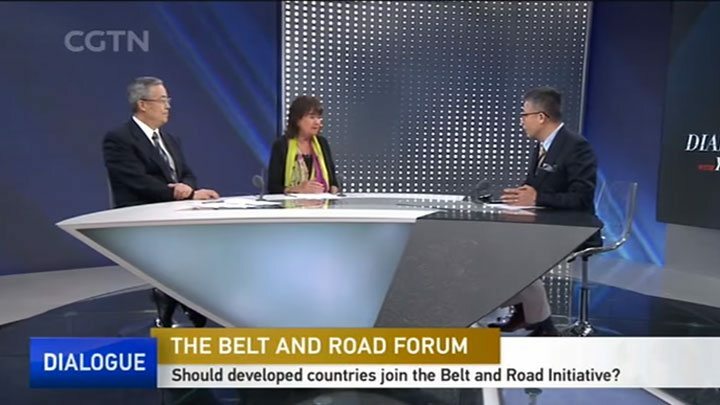 Helga Zepp-LaRouche is a feature guest in a program “Dialogue” on CGTN, 24-hour English news channel of China Central Television (CCTV), based in Beijing, on the eve of “the Belt and Road Forum” held on May 14 – 15 in China. Q. What do you make of China’s global ambition? Helga Zepp-LaRouche: I think it’s very important strategic initiative because it’s the only way how you solve all problems–regional, cooperation, underdevelopment, poverty. It’s really a historic mission. I cannot see anything else, not from the United States, for sure, not from Europe and so I’m really optimistic. I think yesterday was a fantastic, historic moment. Q: But, do you think China is ready? 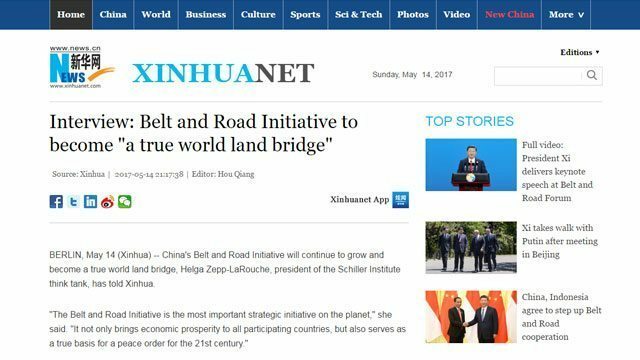 Yang Rui: No wonder President Xi Jinping calls the Belt and Road Initiative the project of the century. Q: [India says] Hey, the Sino-Pakistani economic corridor will somehow go through the contentious territorial area of India, Kashmir; therefore, they refuse to get involved with the Belt and Road Initiative. The spokesperson of the Indian Foreign Ministry even protested against the idea of the economic corridor between China and its geopolitical rival, Pakistan. What do you think of the rivalry, the geopolitical rivalry that China wants to really keep a distance from? Zepp-LaRouche: Well, first of all, India has always been the subcontinent and therefore they have a long tradition of geopolitical thinking. But, I think this has been reinforced by the British colonialism, and the British, and formerly the U.S. administration before Trump played on that. They played Pakistan as the state terrorism state, and trying to hype up sentiments in India to further this conflict. And I think the opposite is true. Because of the British division of India into Pakistan, Bangladesh and India, the only way how this can be overcome is increasing the connectivity among all the countries–Nepal, Bangladesh–all these countries want to be integrated. 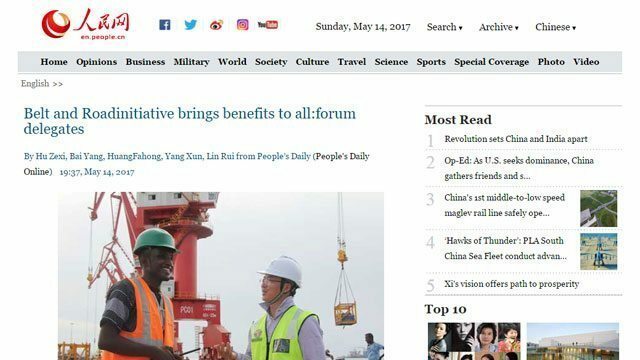 And they call it “connectivity”; they don’t call it the “Silk Road” and they don’t call it “Belt and Road Initiative,” because that’s associated with China. But in substance, all of these countries are urging for more development like that. Q: What’s interesting is that both sides [China and U.S.] announced their joint projects, the list of projects, simultaneously. Do you think something must have been discussed at the Mar-a-Lago summit in Florida, between Trump and President Xi Jinping? And actually the announcement of this list of mega-projects between the two sides is an indispensable part of what has been agreed upon by the two heads of state? Zepp-LaRouche: I think so, because President Trump has announced that he wants to have investment in $1 trillion worth of infrastructure in the next ten years. The American Society of Civil Engineers estimates that $4.5 trillion actually is required, and Chinese experts have said that the United States needs $8 trillion worth of infrastructure. Now China in the past years has shown a tremendous expertise in building fast trains and other projects of infrastructure, and China has also $1.4 trillion in U.S. Treasuries, which we have proposed it invest in an infrastructure bank or national bank in the United States, and then invest in the building of infrastructure. Now that would be a total game change. And if China, in return, would invest in the Chinese market, which is growing because of the growing buying power, you could replace the competition between the United States and China through cooperation. And then they could join hands and have joint investments in third countries, like rebuilding the Middle East, developing of Africa. I think it’s important that you’re not just talking about infrastructure and economics. We are really talking about a new era of civilization, where you replace geopolitics with a completely new set of relations among countries. And if the United States and China could solve this–you know, I have said many times that if President Trump would go for this, he could become one of the greatest Presidents in the history of the United States. And many of his critics don’t think that is possible, but I am absolutely convinced that we are very close to it. Q: In effect, overseas observers pointed out, it seemed as if [President Xi] was talking to two audiences at the opening ceremony. For the international audience, he promised to export our technology, our ideas about Belt and Road Initiative, to reestablish the world order and to reconsider the idea of globalization internally. He also promised to rejuvenate the nation, to tell a China story through the Belt and Road Initiative…. To the surprise of many who are very skeptical about the economic relationship between Japan and China, two arch-competitors, economically and geopolitically as well, the Japanese government decided to send a senior delegation, which was headed by the head of the ruling party, the LDP, Liberal Democratic Party. And this head of the delegation also handed over a letter from Prime Minister Shinzo Abe to the host of the Belt and Road Initiative summit. What do you think of the possibility that Japan will seize this opportunity to drastically improve, not only the balance of ties, but also to enjoy the dividends of the Belt and Road Initiative, so that it will not be excluded from rebuilding the world economic order? Zepp-LaRouche: I think it is very clear that Prime Minister Abe has the intention to do that. I think he sent de facto the number two of the LDP to the summit. I think it has to do with the change in perception that the world is indeed changing. If you look at the rapprochement between Russia and Japan over the last period where Abe has the intention to have a peace treaty during his time in office. There were many visits of Abe to Russia, and vice versa, Putin was in Tokyo, so I think given the fact that China has a very close relationship with Russia, and the offensive policies of the United States, of intervention in foreign wars — with Trump, he has said he doesn’t want to do this anymore, the situation in the South China Sea has completely shifted, it’s no longer such an important hot spot — I think we are on the verge of fixing the world according to completely new rules. And I think it’s really a time for people to rethink and not stick to old geopolitical schemes, which have been in the Cold War, because we are on the verge of a completely new era of civilization, and I think what Abe did, reflects that. Q: Ironically, the young leader of the D.P.R.K. test fired a missile to coincide with the policy speech by President Xi Jinping at the Opening Ceremony. Yet the elected leader of the R.O.K., Mr. Moon, promised to reconsider the deployment of the THAAD, a missile…. That may have paved the way for an apparent improvement in the relationship, which has been frayed seriously by the THAAD deployment. What do you think of the R.O.K. delegation and in fact, a rumor went around the internet that President Trump called for a boycott of the belt and road summit saying “Hey, why did you invite the D.P.R.K. to attend the summit when the international society, through the UN Security Council imposed yet another economic sanction — which I believe is well underway — what do you think of the concerns, allegedly, the major concerns by the international media?… But I am afraid that those who are very skeptical about China’s intent, may point out, citing President Bush, Jr., that bad behavior should not be rewarded. So this invitation for the D.P.R.K. delegation has been very controversial. I’d like to have your take? Q: Excuse me, but harmony would become a lost sense, if we do not respect some of the principles, which have a lot to do with national security. The nuclear program of the D.P.R.K. has indeed endangered three northern provinces if any nuclear fallout were to occur! That would be a major threat [crosstalk] to national security. Zepp-LaRouche: But the new President of South Korea has basically said that he wants to go back to the Sunshine Policy of economic cooperation with the North. North Korea only has nuclear missiles because they were afraid they would have the same fate as Saddam Hussein or Qaddafi. And once the threat is away and we return to the Six Party Talks and the Sunshine Policy, and especially if this is in the context of the Belt and Road Initiative, I am absolutely confident that this problem will go away very shortly. Q. The last question is whether there’s going to be a collision or a clash between Russia’s brainchild of having the Eurasian Economic Union and the Belt and Road Initiative? Because there have been speculations by the media who say, “Hey, Russia may show its great concern about China’s interference with the internal affairs of its traditional backyard, Central Asia through perhaps the role of the Shanghai Cooperation Organization.” And therefore, they focus on whether there’s going to be inconsistency and discrepancy between Russia’s Economic Union and the Belt and Road Initiative: What’s your take? Zepp-LaRouche: You will be happy to hear that President Putin, who was the guest of honor at the Belt and Road Forum, already gave a press conference where he said that not only does Russia support the Belt and Road Initiative, but he will take an active role in promoting it. And if you look at the number of leaders and countries that are now joining, you have a total change in the dynamic– Tsipras from Greece, the Serbian government, the Czech Republic, Hungary, Belarus, Italy, Spain, Portugal, and Switzerland–all of these countries have said they want to become hubs of the Belt and Road Initiative. So even if the German Economic Minister at the Forum was not so friendly, let’s say, I think Germany will be soon surrounded by countries that want to be part of it, and I think this will tilt the situation. The former Prime Minister of France Raffarin gave a passionate speech why France should be in it, and he was sent by the new President Macron. So I’m absolutely convinced in half a year, the majority of the nations that are still reluctant will recognize that it is in their best interest. Because, for example, Germany should have a fundamental interest in cooperating. I mean, German industry, the Mittlestand, the medium-sized industry, are exactly the complementary kind of economic force that would perfectly work with China. And I think it will come around., I promise. Yang: Despite the success of Emmanuel Macron, the European Union is indeed in trouble. And President Trump’s idea of prioritizing American interests, putting America first, may also isolate this country from the rest of the world. During this absence, China is said to be ready to assume the leadership. 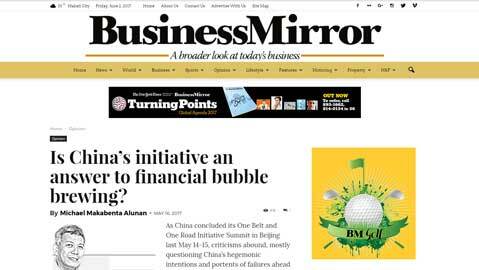 Is China ready? We’ll keep this discussion open. Until next time, goodbye. Mrs. Zepp-LaRouche addressed the conference on Sunday and Monday, both at the Thematic Session on Think Tank Exchanges and at the 5th Global Think Tank Summit. It is obvious, that the World Land Bridge is ideal for completing the development of the landlocked areas of our planet. The colonization of nearby space will be the obvious next phase of the infrastructural opening up of the natural habitat of man. Looking at the world land map, the United States is not merely a country surrounded by two oceans and two neighbors, but can be a center part of an infrastructure corridor which connects the southern tip of Ibero America through Central and South America with the Eurasian transport system via a tunnel under the Bering Strait. Since President Xi Jinping made the offer to President Trump for the US to join the Belt and Road Initiative, there is now a practical proposal on the table, where the US can become an integral part of the World Land Bridge. The infrastructure requirements of the US, which are enormous, could be a perfect opportunity to convert all or part of the $1.4 trillion China is holding in US Treasuries into such investments via an infrastructure bank. For example, the US really needs approximately 40,000 miles of fast train lines, if they would want to match the Chinese plan to connect every domestic larger city by fast train by the year 2020. Since President Trump has declared his intention to reintroduce the American System of Economy of Alexander Hamilton, Henry C. Clay and Abraham Lincoln, and also reintroduce the Glass Steagall legislation of Franklin D. Roosevelt, the possibility of an early establishment of a National Bank and a Credit System in order to channel Chinese holdings into infrastructure investments is near. The positive new prospect of US-Russia de-escalation and military to military cooperation in Syria, along with the Astana process, now puts stabilization of the entire region in sight. Offers by China to extend the New Silk Road to Southwest Asia already exist. The New Silk Road must–as the ancient one did–lead to an exchange of the most beautiful expressions of culture of all participating countries in order to succeed. The true meaning of Win-Win cooperation is not just the material benefit of infrastructure and industrial development, but of making the joyful discovery in other cultures of the beauty of their classical music, poetry and painting, and, by knowing them, strengthen our love for mankind as a whole. 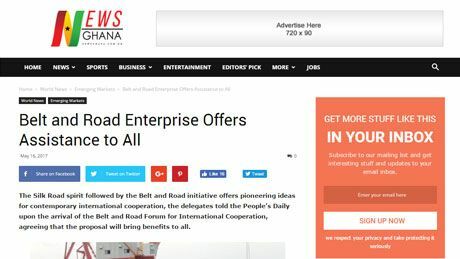 The Silk Road spirit followed by the Belt and Road initiative offers pioneering ideas for contemporary international cooperation, the delegates told the People’s Daily upon the arrival of the Belt and Road Forum for International Cooperation, agreeing that the proposal will bring benefits to all. Perhaps, it is wise to learn from history that every time there are solid developmental projects for the good of humankind, the ruling financial oligarchs of this world bank bankroll conflicts and world wars (i.e the British oligarchs and Wall Street like the Rothschilds, Harriman, Prescott Bush, et al funded Hitler initially).